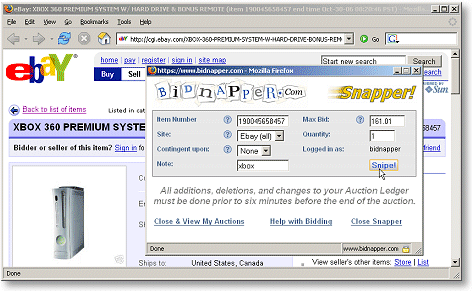 Bidnapper's Snapper feature makes it easy to enter bids while you shop eBay without having to have the Bidnapper window open. It is easy to set up on your browser's toolbar, and is always ready when you want to bid. Open the toolbar on your browser, if it is not already open. Drag the Snapper link to the toolbar, and release. Go to eBay® and search for items you want. When you find something, click the Snapper link on your toolbar. Bidnapper's Snapper window will open with the item number already filled in. If you have not used the Remember Me feature on Bidnapper, or if you are not logged into Bidnapper on another browser window, just enter your user name, password and maximum bid, then click "Snipe". You will get a confirmation screen that tells you your bid has been added for sniping. Snapper works especially well when you checked the Remember Me box the last time you logged into Bidnapper. Even if you close the browser window on which you were logged into Bidnapper, you remain logged in. When you click the Snapper link on your toolbar, you will already be logged in, and you will not have to enter your login again on Snapper. You may do it from this page after you have joined. Problems getting Snapper to work?